Philadelphia Comic Con: Free Stuff! Sure we got bags with a bunch of garbage in them when part of the team went to the Philadelphia Comic Con (hosted by Wizard) last weekend , but that doesn’t mean all free stuff is bad! 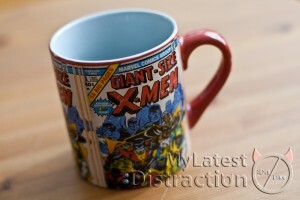 I bought Pete the mug pictured so you could get this one for free! Or take $10 off any order at SuperHeroStuff.com. Just make sure to use the code “PHILLY1”. The offer is good until July 31, 2010, so go now! Enjoy! And don’t forget…if you want to thank us for these savings, COMMENT on the site! We love comments! !